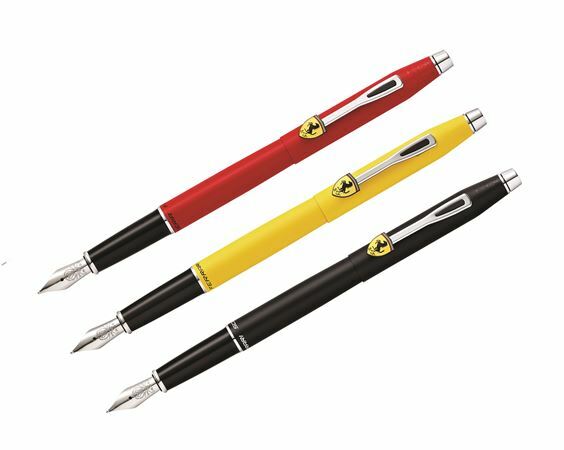 Order your Cross Scuderia Ferrari Century Fountain Pen today from FahrneysPens.com. Fine Pens, Refills & Luxurious Gifts – great prices & fast shipping. Share your passion for Formula 1™ racing with the Scuderia Ferrari Classic Century’s slim, aerodynamic profile in bold signature colors. The custom-designed clip recalls the nose and cockpit of a Formula 1 race car and bears an authentic Scuderia Ferrari emblem. Rich matte lacquer finishes make a statement in Modena Yellow, Rosso Corso Red or Black, all with polished chrome fittings. Available in fountain pen with stainless steel nib, capped rollerball or twist ball pen.